Spring is the time for fresh, baby, vegetables, greens, and other tender produce. Our palettes change with the seasons, and where winter is full of warm, comfort foods—spring is time for light and tender salads. 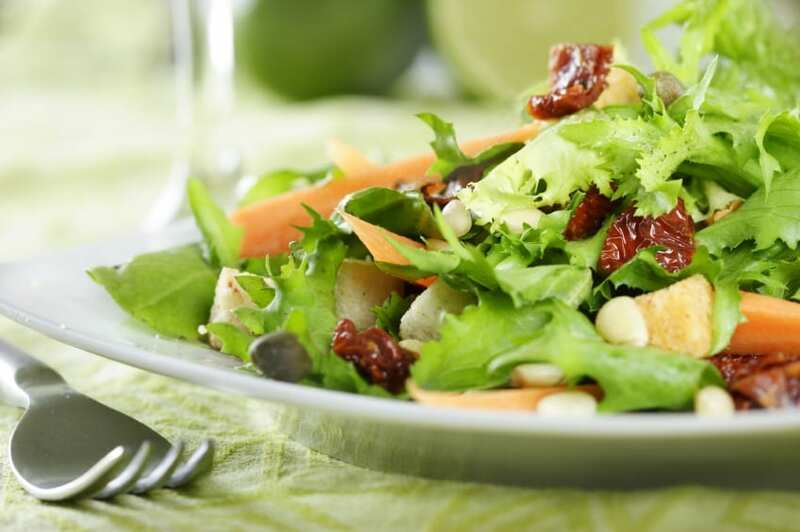 Learn all about our easy spring salads anyone will enjoy and both your taste buds and your tummy will thank you. Spring is the perfect time of year for a tender greens salad tossed with a savory yet light vinaigrette. Choose Bibb lettuce, Boston Lettuce, arugula, mesclun, and/or mache because they are especially succulent this time of year. Be sure you choose bright, fresh, and crisp lettuce that you wash immediately when you get home. Lettuce should be completely dry before it is tossed with dressing. For the salad dressing mix one parts olive oil to one parts vinegar with salt and pepper to taste. Drizzle over clean, dry, lettuce pieces and enjoy. Beets are the root vegetable version of candy. They hold up well to strong flavors, and provide hearty sustenance on those cold spring evenings. Preheat oven to 400 degrees. Peel 2.5 pounds of beets (a mixture of red and golden beets would be nice here), and chop them into bite sized pieces. Place beets on a sheet pan lined with foil, drizzle with olive oil and salt. Roast the beets until fork tender, around 45 minutes. Let the beets cool. Toss beets and oil from the pan with arugula or dandelion greens, goat cheese crumbles, sunflower seeds, and a drizzle of balsamic vinegar. Serve immediately. This salad is an excellent gluten-free, whole grain, salad. It would be an excellent side dish or a light lunch. Please follow Martha Stewert’s recipe for Rice Salad with Asparagus and Peas. Don’t be afraid of the fishiness of the anchovies in the recipe, they really do add an excellent flavor that your guests will be asking about. A cape cod chopped salad really is a salad classic for all seasons. To upgrade this salad from an appetizer to an entrée, add some chilled and chopped grilled chicken breasts. I would also be tempted to add some asparagus, radishes, baby artichokes, and/or peas, to take advantage of all of the spring bounty you can find in your grocery store, garden, or farmers market. This recipe for Cape Cod Chopped Salad is from the Barefoot Contessa. Are you wanting something more than another green salad this spring? Well, you are in luck. Bonappetit has an amazing Strawberry-Rhubarb Salad with Mint and Hazelnuts to add some color to your spring table. This salad is sweet, tart, and entirely unexpected. Furthermore, it is incredibly easy! This strawberry-rhubarb salad could be a meal unto itself, or served alongside fish, chicken, eggs, or pork. If you would rather, I bet you could even serve this salad as the final course to a nutritious and fresh meal.